After two years of discussion leading to an official take-over late last week, Warrnambool Buslines has bought Mt Gambier-based McCormicks Bus Service, picking up 12 buses, plus two under Government contract, and establishing a base of operations in South Australia. Bought through Warrnambool Buslines subsidiary Buslink SA, Director Sam Lucas says previous owner Brian McCormick will stay with the company as General Manager, and all staff have been retained. The Mt Gambier operations will continue to trade under McCormicks Bus Service livery, but managed by the recently created Buslink SA reporting to Warrnambool. Warrnambool Buslines has a long history in Mt Gambier, continuing to run its V/Line contracts out of South Australia’s eastern regional city. "We have always run in and out of Mt Gambier but we haven’t actually operated inside South Australia," Lucas says. "Mt Gambier has always been the western end of our sphere of influence," he says. 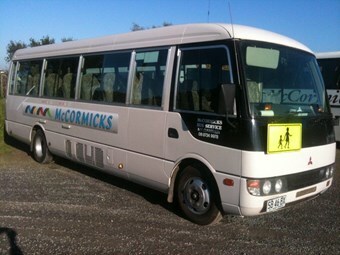 McCormicks operate Mt Gambier’s town services as well as some privately contracted Catholic school bus services. Lucas says the agreement had been amicable with the intention of forming a partnership with the McCormick family. "We didn’t wander in with a bag of money and say ‘let’s get the deal done’," he says. "We wanted to improve life for both of us and it naturally progressed into a transfer of the business." Lucas says Warrnambool Buslines will add support to the Mt Gambier business with fleet management and service planning, which he says can be difficult for smaller operators to organise because of economies of scale which can now be brought to the operation. "But Brian is a good operator, so there are no huge changes we are planning to make," he says. "We will make some changes to the maintenance procedures, but that’s all back end stuff." Warrnambool Buslines operates about 350 vehicles in regional Australia, predominantly in Victoria and Queensland, and could soon increase its fleet size through the current rounds of South Australian Department of Education and Child Services (DECS) school bus tender proposals. Lucas says Warrnambool Buslines’ DECS tender proposals preclude the McCormicks operation which doesn’t operate this type of school run. "In the tender process at the moment we will look to see if there is any advantage for us to look at any of those runs," he says. "We are not interested in taking over every school bus run in every corner of South Australia, it’s much more sensible for the incumbents in those (remote) areas to operate them." Warrnambool Buslines tendered in the first DECS round, but wasn’t successful. "Because of the nature of the tender process, if you didn’t request for tender you didn’t have a chance to look at the available runs," Lucas says. "We’ve thrown our hat in the ring and we’ll see what happens." With the exception of pursuing DECS school runs, Lucas was clear that Warrnambool Buslines has no intention of looking further to acquire other South Australian urban or regional route service operations beyond McCormicks in Mt Gambier.